Featuring an elegant curved top and fabric upholstery, the Gracie headboard is finished with glamourous silver nail heads trim. It provides the ultimate comfort with polyester fabric and thick high density foam. The Gracie is a timeless design that will bring a sense of style to your bedroom. The wood posts, featuring 5-level adjustable to the headboard and 2-level adjustable to the bed frame provide more flexibility for you to configure the height of your bed. Traditional adjustable metal bed frame such as Leggett and Platt bed frame will work well with the headboard. 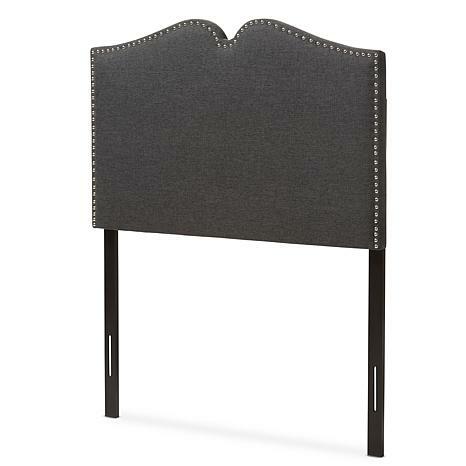 Made in Malaysia, the Gracie full size headboard requires assembly.